There are a couple secret places that I honestly hesitate sharing with the world...however, this one is just too good to keep it a secret any longer. Part of the reason it is so good is because it is soooooo easy. What busy mom, or procrastinating dad, doesn't need an affordable adventure to fall back on when the family is in need of a memorable weekend away from regular life? 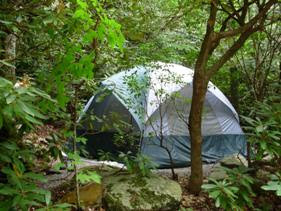 Well, this is it....Montreat Campground, easily accessible "tent" campsites hidden among a thick forest of rhododendron with the quintessential stream nearby to wet your toes, catch crawdads, and fall asleep to. Just 1.5 miles from Montreat gate, and about 5 or 6 minutes from downtown Black Mountain, this little slice of enchantment will take you to another more peaceful and simple state of mind. The great thing is it is $17 per night for a campsite, bathrooms and washrooms nearby, open weekends now until June 1st when it will be open through the week. We have gone here many weekend evenings, spur-of-the-moment, when we needed to step back from reality. Some of my favorite campsites are 4, 22, 29...however, it is hard to go wrong especially if you can get one near the river. Below is also a picture of their cute little playground; however, I can't imagine pulling the kids away from the stream. Just before you get to the campground you will also come to Calvin Trail Picnic Area, more locally known as "Monkey Bottoms." Here you will find great huge picnic tables, outdoor fireplaces, and a perfect section of river to rock hop. We have been known to even bring take-out, a couple blankets, rock hopping shoes, and just sit back enjoying nature's perfect ambiance. Wish I had a picture of this idyllic little spot, but my camera is on the fritz so just picture perfection! So, it's not to late to head up there this weekend. Click the link, give them a call, and throw your tent and sleeping bags in the car. Worth and I want to "test" out camping with the girls there. If we needed to get home in a hurry we could. I love monkey bottoms and have many fond memories going there as a camper at Merri-Mac. I am so fortunate call Black Mountain home now. I have never seen that playground. I will have to go find it now! Maybe we will go there today when BellaRose wakes up from her nap!